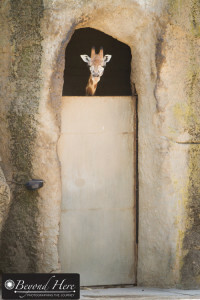 Yesterday I had a unique experience – I was shooting wildlife images alongside Beyond Here readers. That’s a first! Bob and Rae are from California, USA and had read my post Favorite Wildlife Photography Locations. Looking back on that post, I wrote it in the first 3 months of Beyond Here. That’s a long time ago now, way back in mid 2014. It must have been meant for Bob and Rae as I even spelled ‘favorite’ with the US spelling! 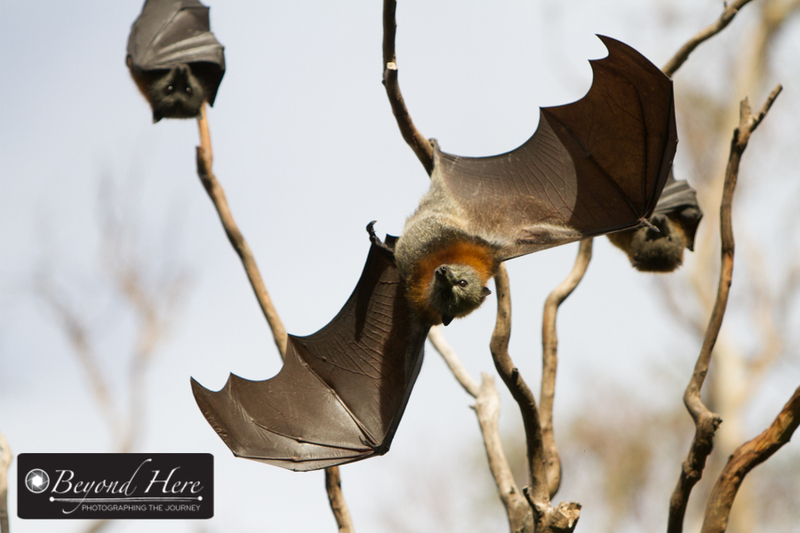 There is a large group of Flying Foxes at Yarra Bend Park meaning we could shoot a variety of images. Bob and Rae contacted me a few months ago. 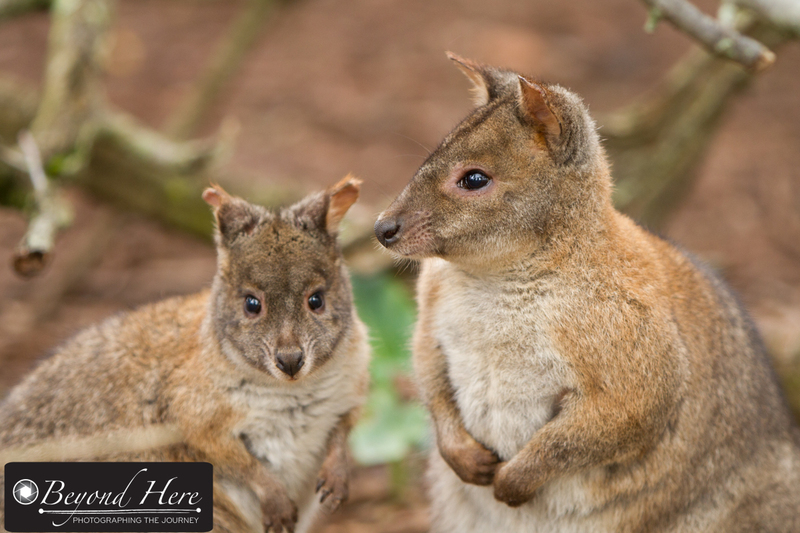 We shared ideas on good wildlife photography locations for their trip to Australia. I made some suggestions for Melbourne and around Victoria, keeping in mind that transport can be tricky when you are in a foreign country where the locals drive on the opposite side of the road! Fast forward to this week. They arrived last Sunday and contacted me by email. 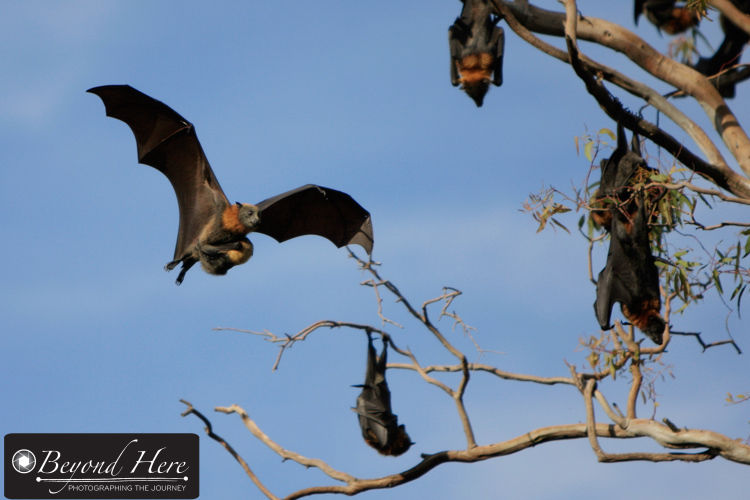 By chance, I had a fairly light week planned and had time to join them at Yarra Bend Park to photograph the large group of grey headed flying foxes which roost there. How cool. Shooting wildlife images alongside Beyond Here readers from the US. 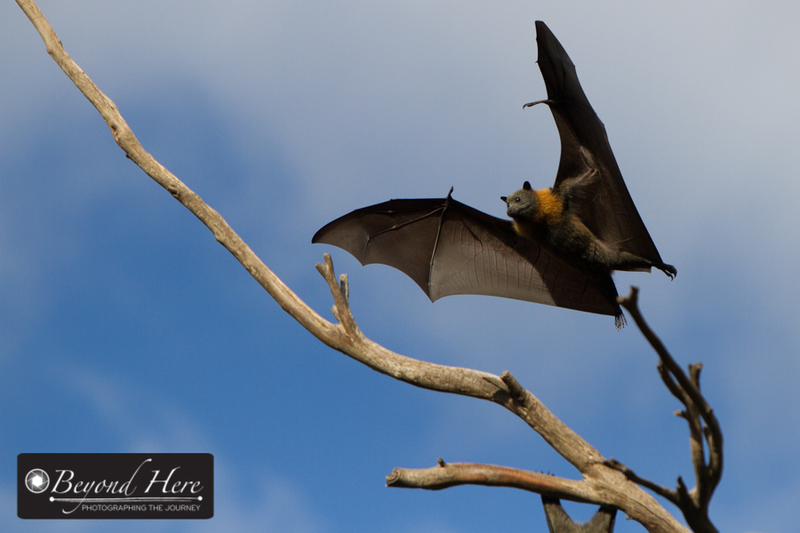 We spent a few hours exploring the park and shooting images of the flying foxes. 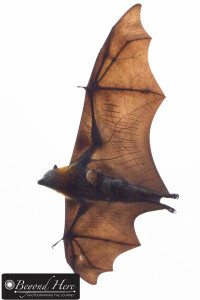 Bob found it a unique experience as he is used to small bats, not large flying foxes. 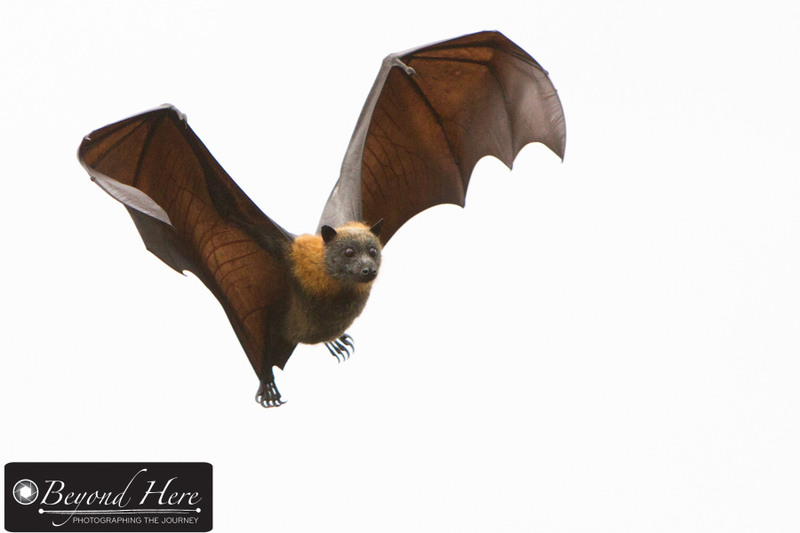 The grey headed flying foxes are active during the day, so Bob was able to get a range of images. That included everything from bats hanging upside down sleeping in the trees next to the river, through to groups of them in flight. It was a lot of fun meeting Bob and Rae and showing them around one of my favorite wildlife photography spots. It never occurred to me that writing Beyond Here back in 2014, I’d some day be shooting wildlife images alongside Beyond Here readers from the other side of the world just 15 minutes from my home. 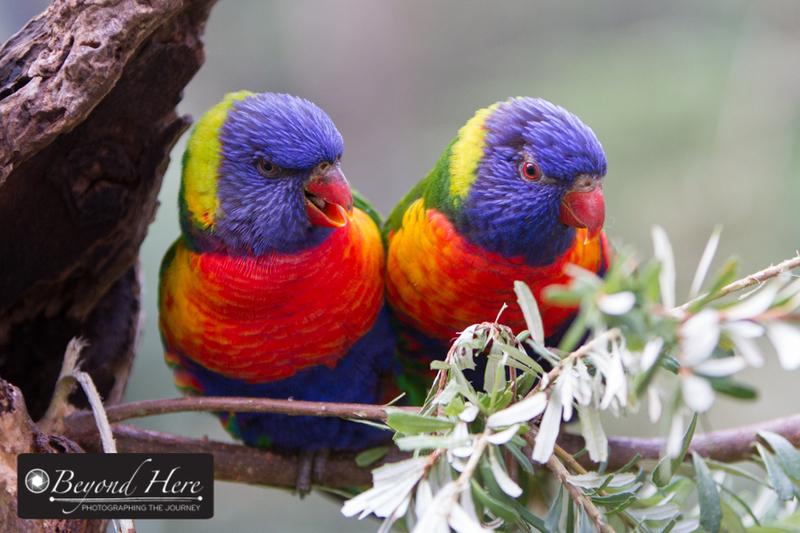 Bob and Rae are in Melbourne for another few days before exploring parts of New South Wales and Queensland. To you both, thanks for making time to say hello and explore Yarra Bend Park together. I hope your images from yesterday are good, and that you have a great time in Australia. Thanks for reading shooting wildlife images alongside Beyond Here readers. Happy shooting. This entry was posted in Wildlife and tagged australian wildlife, wildlife, wildlife photography on May 30, 2018 by Craig Dingle. Every once in a while I receive an email asking to use one of my images for free. This happened earlier this week. The email was from a conservation organisation doing work to protect endangered species of animals. 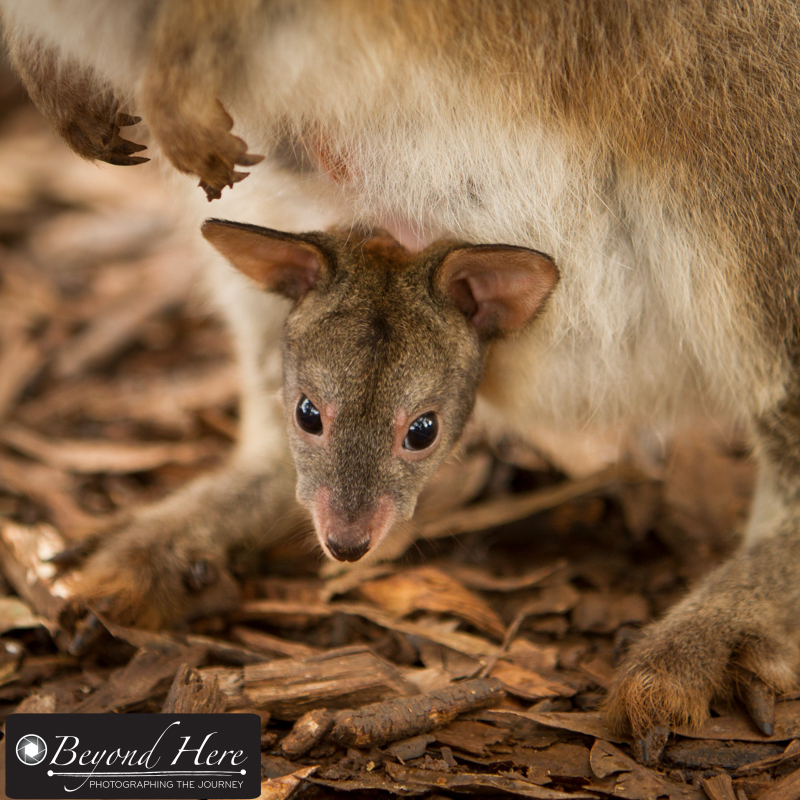 The request was to use one of my tree kangaroo images. I wonder, would you give your images away for free? The email request provided me a link to the organisations website. I’m interested in issues around conservation so I took time to check out their site. They seem to be doing good work, and certainly had a very functional and well presented website. This is a Goodfellows Tree Kangaroo. I don’t know if this is the image they were referring to. All my requests for free use of images come from animal welfare and conservation organisations. That may be because I have a lot of animal images available through image libraries. Or it may be that they have found that asking for ‘free use’ often gets a positive response, and they can save money this way. Who knows? They didn’t attach the image they wanted to use. Most requests do include the image they have found and want to use. I’m not sure if I’m too cynical, but this makes me suspicious. I do wonder whether this was a genuine request from an organisation doing good work, or was a copy and paste effort sent to hundreds of photographers? So, my dilemma was what to do. Would you give your images away for free? I have come across this situation before, and my opening stance is not to give images away for free. It’s not in my interests, and it’s not in the interests of other photographers. I have made exceptions in the past, but my opening position is that the user should be paying for images. Thanks very much for your email. I checked out your website – congratulations on the fantastic work you are doing. 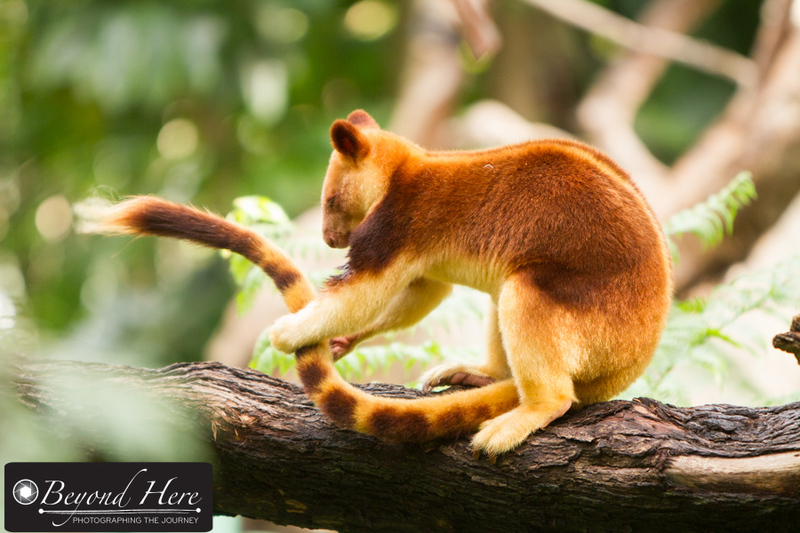 It’s good to hear you are going to feature the Goodfellows Tree Kangaroo. I follow the conservation efforts for them, particularly the work XXXXXX are doing with communities in Papua New Guinea. In terms of images – I’m glad to hear you like one of mine. I hope you’ll understand that as a professional photographer I rely on royalties from licencing images to support my family, so I can’t provide it for free. It should display prices in the local currency where ever you are. In Australian dollars it costs $13 for an individual image. If you need multiple images look at the one month subscription which lets you download 10 images for $40 (you can cancel after one month if you don’t have ongoing image needs). Very best wishes for your work. I’ve signed up for the email updates and will look forward to the piece on Goodfellows Tree Kangaroos. 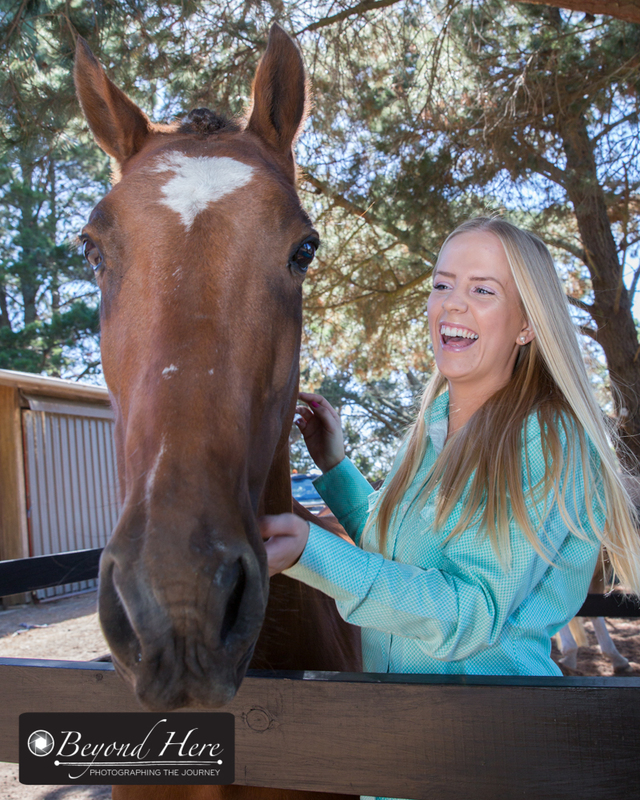 Subscription programs make stock images affordable. I felt I did the right thing introducing this organisation to an image library where they can licence images cost effectively. I feel like I’ve done the right thing by myself and other photographers. I also hope the organisation feel I’ve done the right thing by them – by introducing them to a cost effective way to licence images. The final piece of this story is just to add that my reply was sent 5 days ago. I haven’t had any response. What do you think? Would you give your images away for free? This entry was posted in Business Tips, Stock Photography, Wildlife and tagged iStock, iStockphoto, wildlife photography on April 24, 2018 by Craig Dingle. This week I had a sale of a print on Fine Art America. 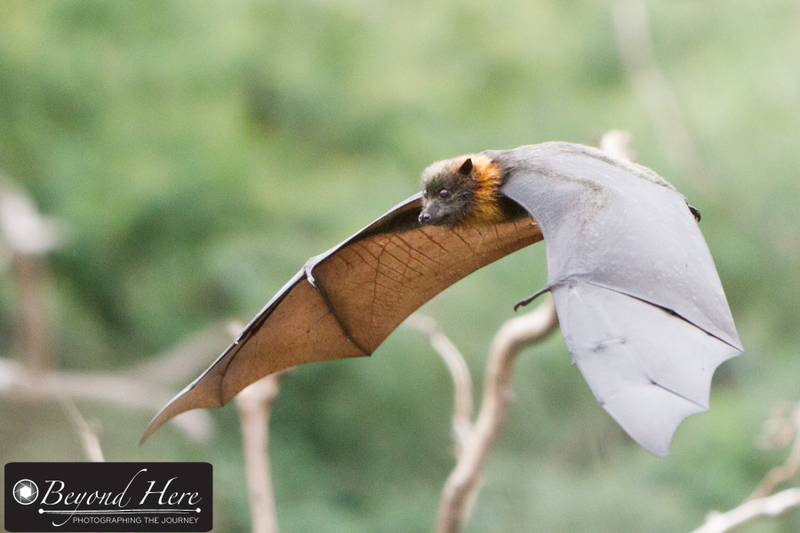 It was one of the extensive range of images I have shot of grey headed flying foxes. The image itself shows the animal flying in mid air with the sun showing the veins in its wings. It’s a cool image, and it will look great as a large print for the US based buyer. I have written lots of posts for Beyond Here about stock photography, but very little about my experience with Fine Art America. Here are five lessons from Fine Art America. What is Fine Art America? FAA is a website where artists can post their work for sale. Unlike stock libraries where buyers purchase the electronic image and a licence to use it, on FAA the buyer is purchasing a print or other physical product. FAA works with printers and other product manufacturers around the world to produce the final product and ship it to the buyer. So here are my five lessons from Fine Art America. Lesson 1 – You need to promote your own work. FAA has not been a source of significant income for me as I’ve treated it like an image library – in that I upload my content and expect the buyer to do the rest. In my experience those who are doing well on FAA are actively promoting their content. They are adding links to their social media feeds and encouraging followers to check out their content. So the lesson is that you need to promote your own work, don’t rely on FAA to do that for you. Lesson 2 – Set your own prices. One of the key differences between FAA and image libraries is that on FAA you can set your own prices. 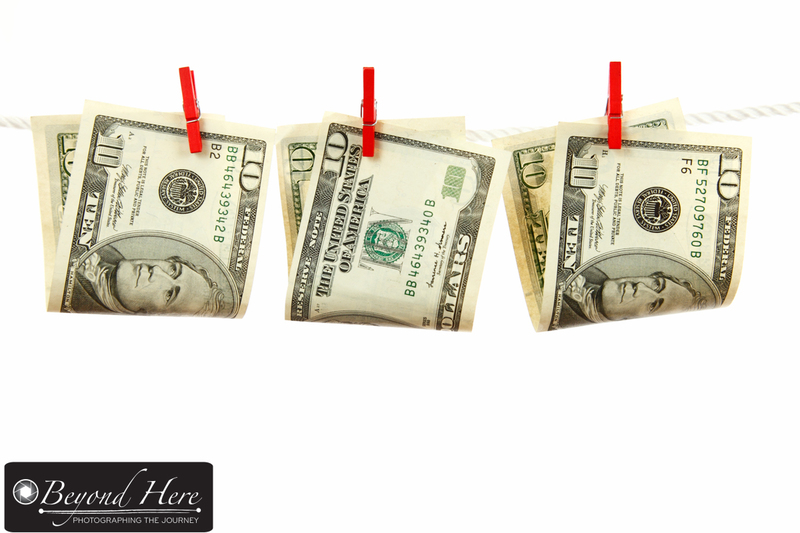 That means you can determine the margin or amount of money you want to make on each sale. FAA has a well organised back end system where you can set prices for individual files or for groups of files. If you intend to make a significant income through FAA it is worth investing the time to price your content appropriately. Lesson 3 – Income per sale will be high. While I don’t have a lot of files on FAA each sale represents a reasonable sized income. In the case of this week’s sale (I only had the one sale on FAA this week!) the income from this one sale is the equivalent to 30 sales of my stock images. So while the number of sales is lower, the income per sale is high. Lesson 5 – You need to continue to add new content. Just like a stock photo portfolio you can’t expect a growth in income without adding new content. I haven’t been very active in adding to my FAA portfolio and this is reflected in low levels of income. To state the obvious, to grow your income stream you need to keep adding new content. My income from FAA is far below my income from stock images. 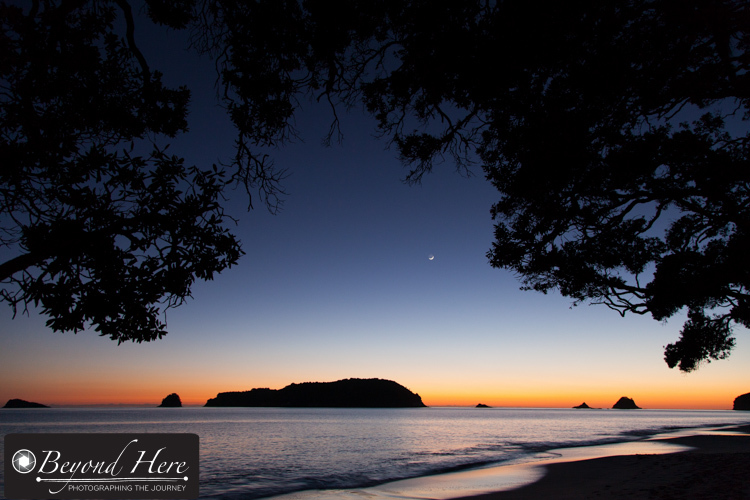 (For background on stock photography please see Why I Shoot Stock). Having a nice big sale this week was a useful reminder of the potential of FAA as a sales outlet for photographers. Do you contribute to FAA? What has been your experience? Thanks for reading five lessons from Fine Art America. Happy shooting. This entry was posted in Business Tips, Wildlife and tagged Fine Art America, stock photography on July 9, 2017 by Craig Dingle. Wildlife photography is a hugely popular field for both amateur and professional photographers. Here are 5 tips for more compelling wildlife images. Look for pairs of animals to add a new dimension to your images. Tip 1 – Look for Pairs of Animals. Solo portraits of animals can make compelling images, but pairs of animals add a new dimension. There is the relationship between the animals and the interaction between them. Look out for pairs of animals. Tip 2 – Photograph baby animals. If you want people viewing your images to “ooohh and aaahh” then build a gallery of images of baby animals. There is something about the cute, vulnerability of baby animals – as well as the connection with the parent that is guaranteed to create compelling images. 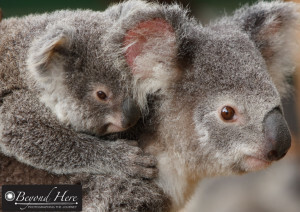 Koalas, like in this image, spend the first few weeks of their life in their mothers pouch. When they become too big, they are transported on their mothers’ back. This period is an ideal time to shoot images which include both mother and baby. Inevitably the baby will be looking small and cute, and mum will be alert in protecting her young one. Animals in action. 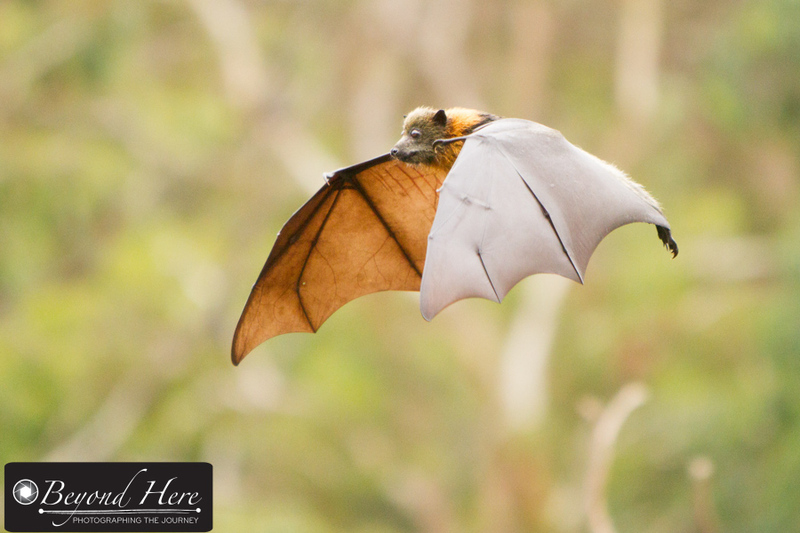 A flying fox carrying its baby. Tip 3 – Look for animals in action. Animals in action, engaging in natural behavior are always more interesting than animals doing nothing. This is particularly why you get very different types of images when you photograph animals in the wild compared to animals in captive environments such as zoos. 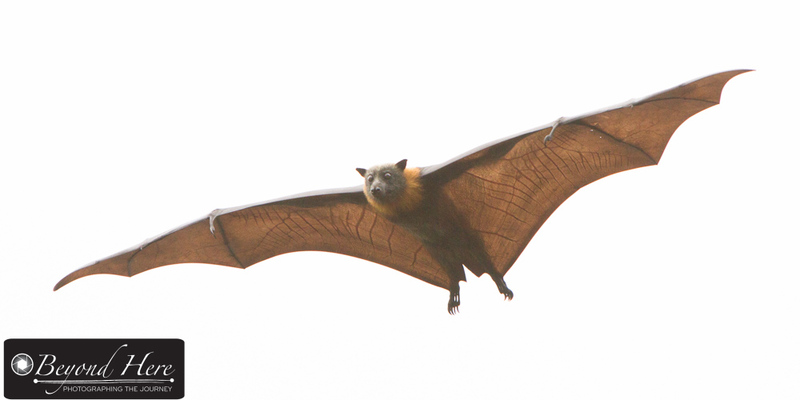 In this image, the grey headed flying fox is flying through the air. If you look very closely you can see that it is carrying its baby at the same time. The baby is clinging to its mothers’ chest and will continue to do this until it is large enough and strong enough to fly alone. This image also emphasizes one of the key features of this animal – the spooky vein structure which is visible in the wings. When you are planning your wildlife shoot, consider what feature of the animal you are photographing you want to highlight. Tip 4 – Shoot from unusual angles. 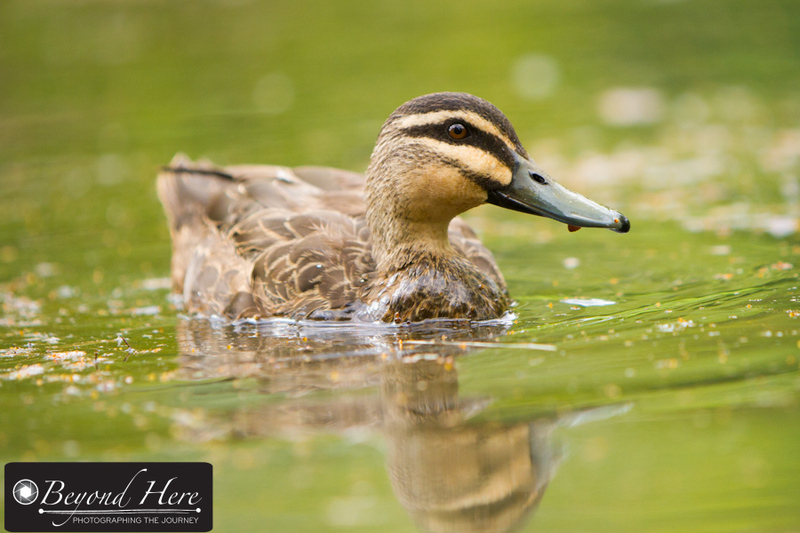 Ducks are very common birds where I live in Melbourne, Australia. 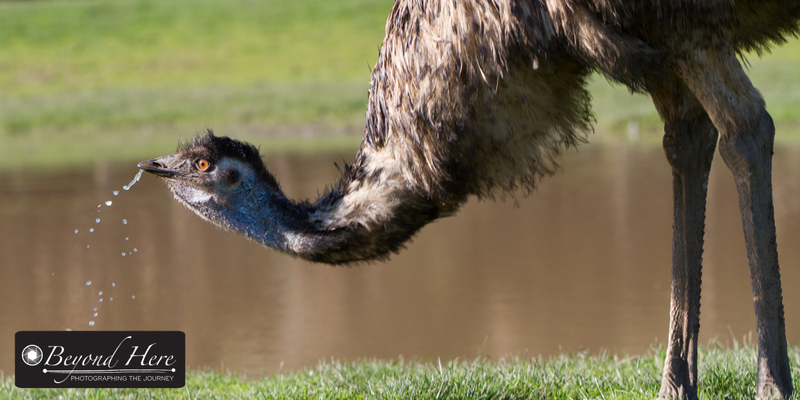 In creating compelling images of common animals, look for different angles to shoot from. In this case I lay down at the edge of the lake, to shoot an image from the duck’s eye level. For more about this shoot, please see this post. Tip 5 – Photograph unusual wildlife. Unusual wildlife make compelling images. This image is a Goodfellows Tree Kangaroo. They are native to New Guinea and are now an endangered species. Images like these are compelling, not only for the beautiful colors of the animal, but also because most people will never have seen this animal. Look for unusual wildlife for more compelling images. Thanks for reading 5 tips for more compelling wildlife images. Good luck with your wildlife photography. This entry was posted in Wildlife and tagged wildlife photography, wildlife photography tips on November 14, 2015 by Craig Dingle. This morning I visited one of my favorite wildlife photography spots – Yarra Bend Park in suburban Melbourne, Australia. 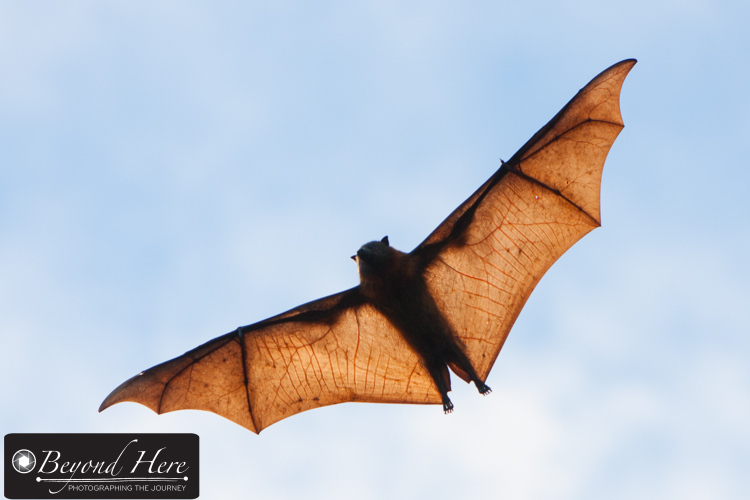 It is about 20 minutes from where I live and has a colony of thousands of flying foxes. If you’d like more details about where to find Yarra Bend Park, please see this post. 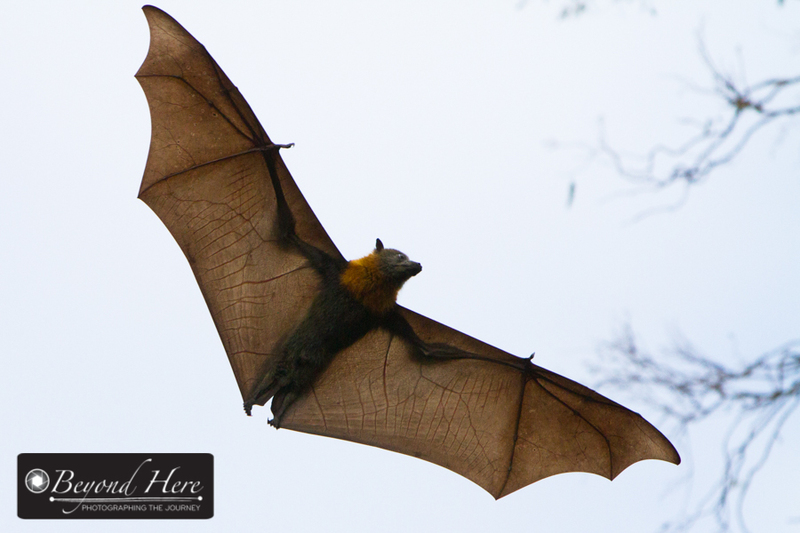 I was there for about 1 hour and made a wide range of flying fox images. Here are 5 tips for making images of fast moving animals. When an animal is moving quickly, getting it in focus is key to a successful image. Use continuous focusing mode on your camera to track the animal as it moves, and to give you the best chance at an image in focus. Increase ISO to help with fast shutter speeds. This shot was taken at ISO400. To allow a fast shutter speed you may need to increase the ISO setting on your camera. In the images posted here the ISO ranged from 400 (for the images shot against the cloudy sky) through to 1250 where I was shooting against a dark green background. The combination of continuous focusing mode, ISO, and fast shutter speed will give the best chance for sharply focused images. In the flying images here I have used 1/2000s for the majority of these images. When animals are moving quickly you will have a large number which are out of focus or not well composed. Don’t be upset, this is normal in wildlife photography. You will find that your percentage of good images increases with practice. It can be tempting to only shoot the animal as it is moving. Resist this urge, and create some very different images when the animal stops. 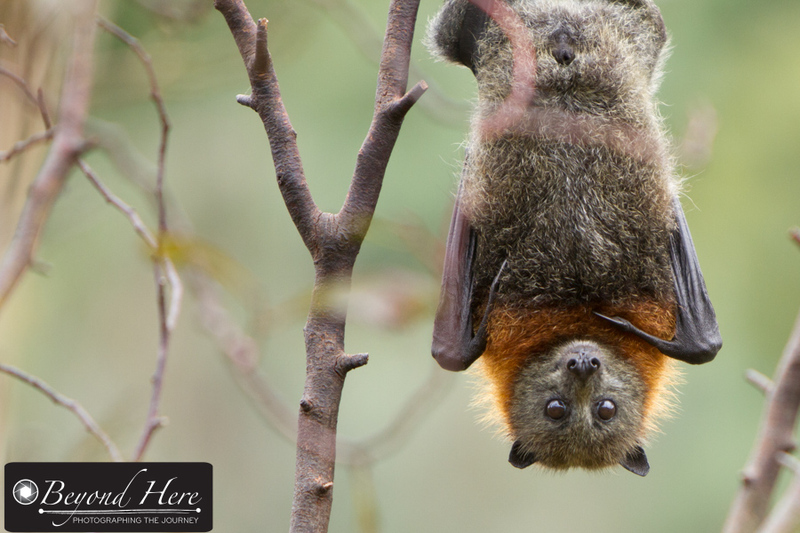 The flying foxes roost in the trees given an excellent opportunity for images as they hang upside down. Thanks very much for reading 5 Tips for Making Images of Fast Moving Animals. Practice will increase your percentage of successful images. 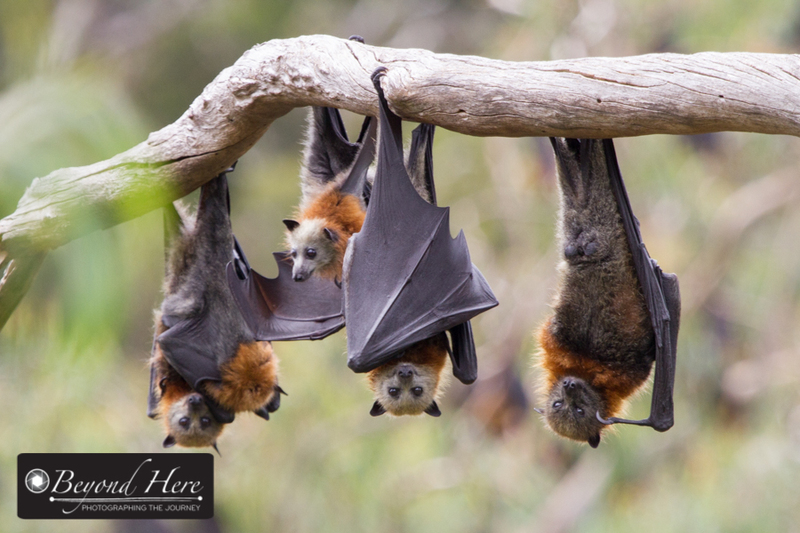 This entry was posted in Wildlife and tagged flying fox, grey headed flying fox, wildlife photography, wildlife photography tips, yarra bend park on March 7, 2015 by Craig Dingle. Want to add more interest to your wildlife, nature, or children’s shots? Shooting at eye level will do it. The alternative is to shoot down on to your subject. While that downward view is the one we see most often with our eye, shooting at your subjects eye level is almost always the more interesting shot. This technique works particularly well with wildlife, children, and flowers. It can take time and effort to get down to your subjects level but it will be worth it for the unique angles and improved shots. 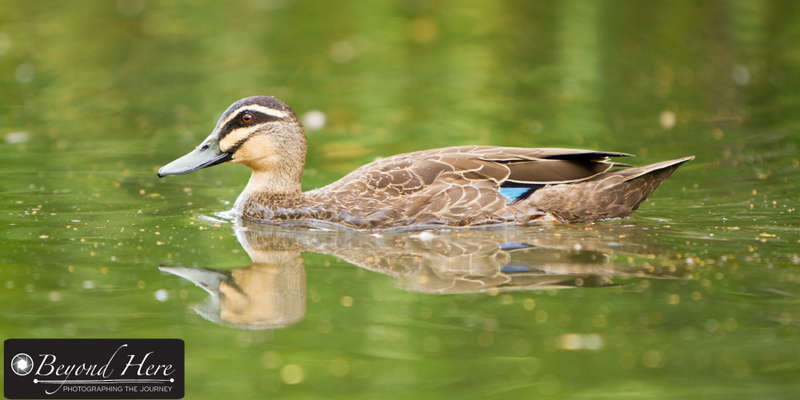 In this image of a duck paddling across a lake it was tricky to get down to the duck’s eye level. To make this shot I lay face down on the ground to get a “duck’s eye” view. People walking past would have thought I looked a little strange (!) but I achieved a series of interesting wildlife images – all taken from a duck’s eye point of view. It was a calm day and the reflection was a bonus. 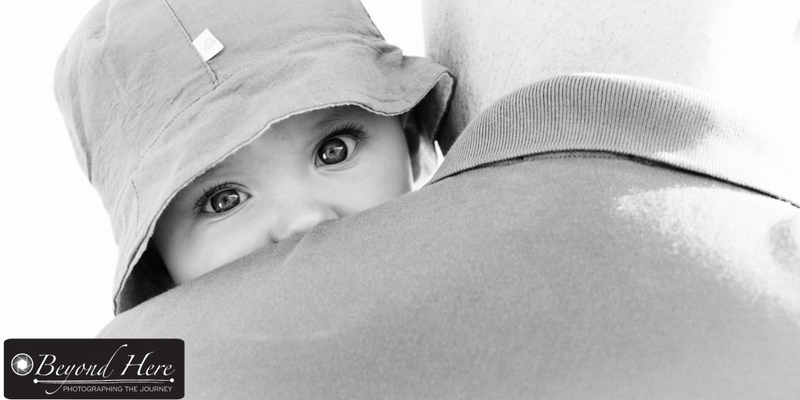 In example two, a child on his father’s shoulder, it was much easier to shoot at eye level. For this shot, the father was holding the son on his shoulder trying to calm him down. Rather than being ‘down time’ in our family portrait session, it was a great opportunity to shoot an eye level portrait of the child. And briefly he stared directly at me. Nice one. Example 3 are tulips. 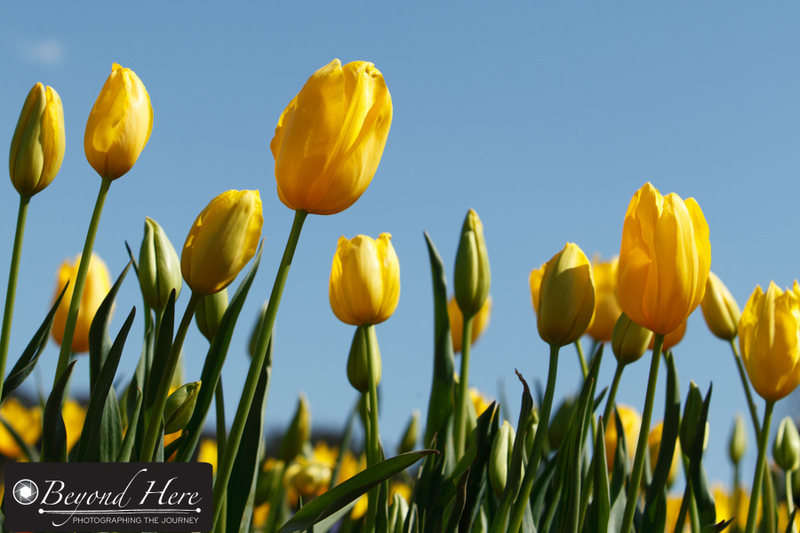 Rather than shooting down from above flowers, try getting down very low and using the sky as your background. It eliminates a muddy, dirty background and replaces it with a blue plain background which highlights the color of the flowers. It isn’t strictly ‘shooting at eye level’ but it is a very different angle than shooting down from above. It can be challenging to shoot flowers differently – but getting down very low is a great place to start. Shooting at eye level often produces outstanding images. Keep this in mind next time you are shooting wildlife, children or flowers. This entry was posted in Photography Tips, Wildlife and tagged family portrait, family portrait photography, flowers, wildlife photography, wildlife photography tips on February 8, 2015 by Craig Dingle. Wildlife photography continues to grow in popularity as prices of high quality digital cameras and zoom lenses continue to fall. Enthusiast photographers are picking up the challenge and creating great wildlife images. Here are some tips from one of my heron images. 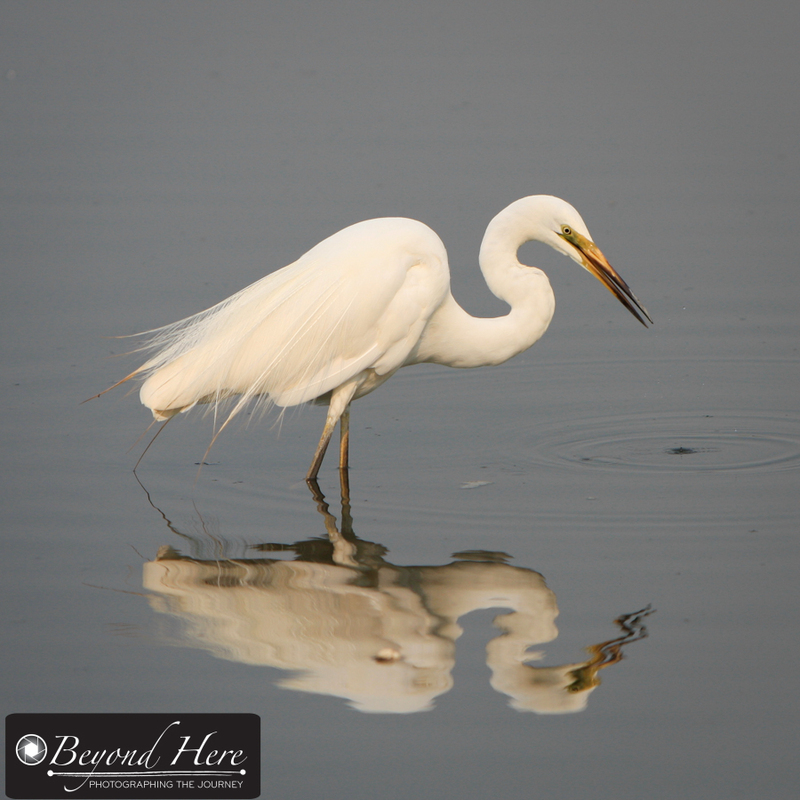 Read on for details on making this waterbird image. This image was taken at Albert Park Lake, just a few kilometers from downtown Melbourne, Australia. (If you are a motor racing fan, this is the lake that the Australian Grand Prix Formula One race goes around). This shot was taken in the early morning, with high overhead cloud and no wind. In fact, it was a surprisingly still morning. (1) Lighting. The high cloud results in very even lighting on the bird. There are no harsh shadows from sunlight. 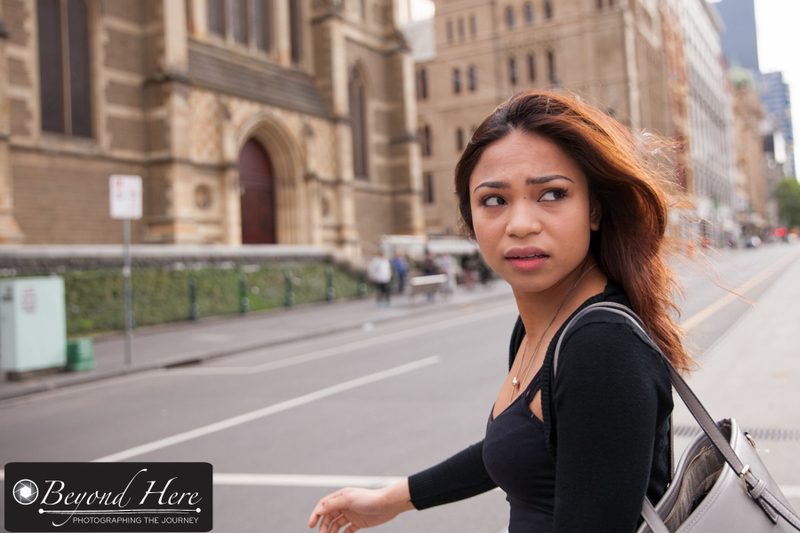 Melbourne in the winter gets a lot of cloudy weather which is ideal for evenly lighting outdoor subjects. (2) Background. I had to walk to get to a position where there were not reeds or other distractions in both the foreground and background. Having a clean background increases the focus on the subject, and that has worked very effectively here. (3) Reflections. Still days can create great reflections in water. You can get them in lakes, but also smaller areas of water. Even puddles can provide great reflections. I composed this image to include the reflection as a key component of the image. (5) Distance. Being some way back from the heron means it was going about its normal business without really being aware of the photographer and the camera. This image was shot with a 70-200mm lens at 200mm on a crop sensor camera (effectively given the equivalent of a 320mm zoom). (6) Crop. I have cropped this image to square format to fit with the shape of the heron. It worked more effectively in this format than as a horizontal dimension image. I hope these tips have been useful in understanding making this waterbird image. Best wishes with your wildlife photography. This entry was posted in Wildlife and tagged urban wildlife, wildlife photography, wildlife photography tips on October 10, 2014 by Craig Dingle.